"HauntedDenver.com is a great site you HAVE to check out!" "If you're looking for Halloween ideas, turn to Denver's largest haunted house directory, HauntedDenver.com!" The 2017 Haunt Season is Almost Here! 13th Floor is coming back in 2017 with a bang! Their new location is 10,000 SQAURE FEET BIGGER. That’s 10,000 square feet for the three new attractions coming this year. Darkest Dreams, (S)Laughter, and Undead: Restless Spirits look so freaky. Here’s the 2017 trailer. Come on… IT’S NOT EVEN FAIR! This year the Asylum Haunted House in Denver is returning in 2017 with 3 brand new attractions. Primitive Fear: Walkers, Contagium: The Escape, and Ridgegate: The Condemned all look beyond freaky. Check out this years trailer, and get hyped to get sacred! More haunts open today – have a frightful weekend! 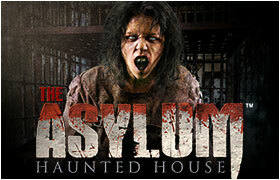 This year the Asylum Haunted House in Denver has Post Mortem: The Escape, an extension of their great haunt. Ridgegate: The Deranged looks freaky-good. Also Primitive Fear, with Mr. and Mrs. Nice coming back this year! Check out their video! Less than a week, the horror begins! 13th Floor Haunted House will open next Saturday, September 17th at 7:30pm. They’ve got a Slasher Remix theme, a Zombie theme, and also a Voodoo theme. Check it out here! See you there fright freaks! 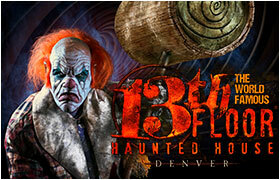 13th Floor Haunted House Denver is opening on 9/17 this year, the first of the season to open, can’t wait! At least one local Denver Colorado haunt, 13th Floor, will be opening on September 18th! Tickets are on sale now, the season is here fear mongers! 10 days until the start of haunted house season 2014! Two of Denver’s most popular haunted houses have announced their opening dates. Today marks the opening of the 2012 haunt season with the opening of 13th Floor! The Denver Haunted House season officially kicks off this Friday, only 3 more days! The Denver haunt season is winding down, but there are still 5 more nights to get out and see haunted houses in Denver. The weather is looking great to finish up with a nice fall night out with some friends. Get a group together, and get out there and enjoy as many attractions as you can, finish strong! Enter your email address to win tickets and get discounts!